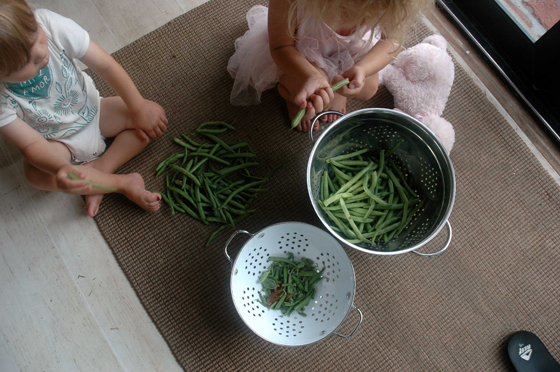 String bean lesson: Even for very young kids, kitchen chores can be communal, teach patience and compassion, and instill all sorts of good food values. I’m not sure what seems to change faster–the procession of in-season veggies that are now marching through our kitchen (cukes, corn, beans, the first little melons), or the evolving eating habits of a child. Now, I’m no advocate for child labor, but I do recognize that even very young kids can be useful around the garden and in the kitchen, like helping to shuck corn or shell fava beans. Such chores can be communal, teach patience and compassion, and instill all sorts of good food values. Clio still doesn’t have the attention span for more than a minute or so of weeding, but she can plant seedlings like nobody’s business. And I’m sure if we had chickens (or ducks) she’d take to the responsibility of feeding them, collecting their eggs and doing whatever else it takes to make them happy. Green beans are actually wonderful in a lot of ways–they’re easy to grow, can be eaten raw in salads or cooked in a million ways, and they seem to prepare the young palette for an interest in out-of-the-pod beans, which we like to make in the off season. During this recent bean meal Clio and I had a somewhat circular discussion as she worked through the difference between green beans (or string beans) and the sort of beans you find in a can, or in dishes like rice and beans, or sold by farms like Cayuga Pure Organics. (We had a bag of Cayuga cranberry beans, which provided a useful visual aid.) And when we made tacos a couple of nights later, with chopped green beans, Clio noted that “in my taco” the green beans were mixed in with the pintos. So I will suggest that, when possible, kids should have to help snap the ends off any green beans they eat. It’s a small act, but scaled up to part of our nation’s food policy, alongside the First Family’s gardening and school-food initiatives, it could be monumental. Two kids cleaning beans can be better than one. Both Cyrus (left) and Clio (right) proudly ate the beans they had helped to clean.